Home of the new reality show, "Fatty's: Where Poker Gets Real"
Fatty's Poker is a new reality series that mixes comedy with competition. This is a story about the "characters" at Fatty's. 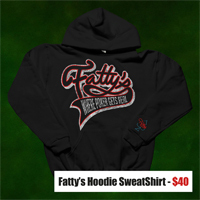 The Fatty's crew is a bunch of regular guys from New York, and the show follows their dream of competing against the world's greatest poker players at the World Series of Poker Main Event and other major poker events throughout the year. View the Fatty's Poker press release. Fatty's Crew Gets Interviewed by ESPN - ESPN Reporter Andrew Feldman caught up with some of the Fatty's Crew at the Main Event. See what The Nose and Big AL had to say about the poker club and the WSOP Main Event. Fatty's Poker and Fantazzle Fantasy Sports Games have joined together to offer a fantasy poker game featuring the Fatty's Five poker team. Go to Fantazzle's Fantasy Poker Games page to sign up to match your poker team against the Fatty's Five team. This is a free fantasy poker game so get in on the action now!